Does Planting Basil Near Tomato Plants Repel Insects? Basil growing near tomatoes in a container garden. I read somewhere that if you plant basil with your tomatoes, it will repel insects and make the tomatoes taste better. Is there any truth to that? Planting tomatoes and basil together is a gardening practice that’s well known and recommended by both amateur and professional gardeners alike. The general consensus is that basil – both the plants and extracts made from the leaves – can be an effective natural deterrent for white flies, mosquitoes, tomato hornworms, aphids, houseflies, and asparagus beetles. 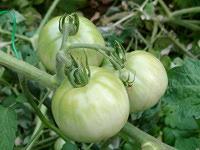 The basil is also thought to (somehow) improve the flavor of the tomatoes if planted nearby. If you go searching for scientific evidence on this idea, you’re not likely to find much. Most of the evidence is anecdotal, and some gardeners find that planting basil near tomatoes makes no difference or even harbors the very insects it’s supposed to repel. That’s often how it is with natural or alternative answers to gardening problems – what works for some may not work for others, and it always takes some experimentation to find the solution that works in your garden. However, we do know that basil and tomatoes plants grow very well together, and they share soil and space quite companionably. You can plant them close together without significant reduction in yields, which is helpful in smaller gardens. And while basil needs plenty of sun, during the heat of midsummer it will benefit from a little afternoon shade provided by the taller tomato plants. So, go for it! It won’t hurt your tomatoes to plant basil nearby, and when you get ready to make tomato sauce, you’ll have your ingredients at hand. For maximum benefit, plant 2-3 basil plants per tomato plant. I am for the basil by tomatoes. I never really thought about it till now but I’ve done it for years. This year I had to grow my tomatoes without a garden and my herbs. So I planted in front yard and my basil has helped with bugs and how well they produced. The ones next to basil are loaded but the ones across the yard has less all same tomatoes plant purchased and treated same. So I believe GOD made the herb to add to the tomatoes.